About Princes Park Construction work began on 14 November, 2005 of the new stadium. Designed by Alexander Sedgley architects, the stadium has a capacity of 4,100 (642 seated), and has been described as one of the most ecologically sound ever built. The pitch level is sunk two meters below the external ground level to reduce noise and light pollution. It is estimated to have cost around £7 million. 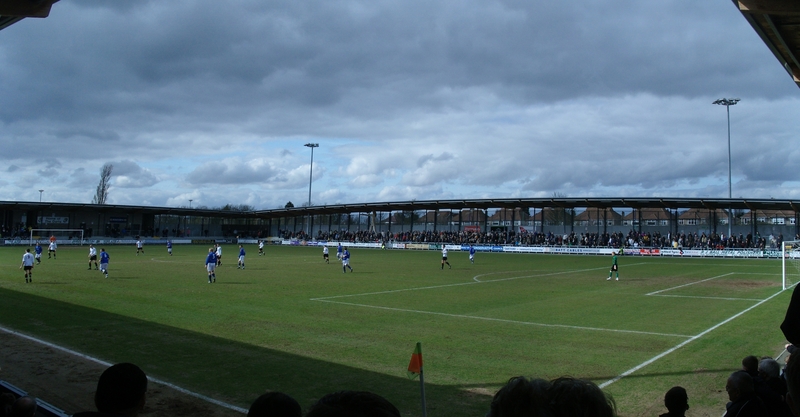 The stadium was opened on 11 November 2006 when Dartford FC, who had been without a home ground in the borough since 1992, beat Horsham YMCA 4-2 in an Isthmian League Division One South league fixture, in front of a capacity 4,097 crowd. The environmental aspects of the stadium include – The stadium roof has a sedum roof blanket, a living roof that provides a natural air filtration system. solar panels on the roof serve the community changing areas and public toilets hot water storage cylinders. The roof is supported by treated Glulam timber beams. Water recycling system which serves the toilets within the clubhouse. Rain water is collected in the two large ponds at the north end of the stadium grounds. Underfloor heating on both levels of the clubhouse. Low energy lighting. Increased fabric insulation to give the clubhouse better thermal retention and efficiency. Condensing boilers to provide a more energy efficient system. Also excavated earth was reused for landscaping the external courtyard areas around the stadium. The club has an excellent sized bar which overlooks the pitch and has a couple of huge TV’s that show live football. 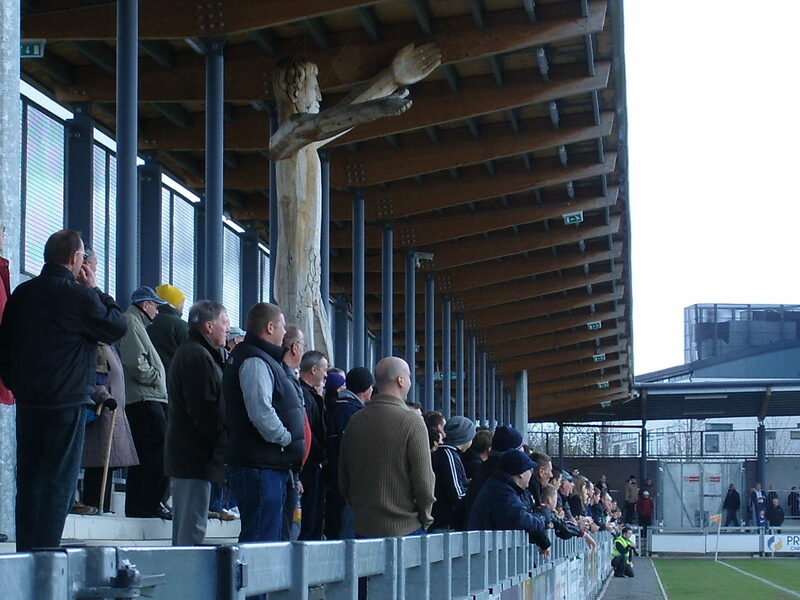 On the opposite side is the unique five and a half metre Wooden Man, aka Dartford’s biggest fan. 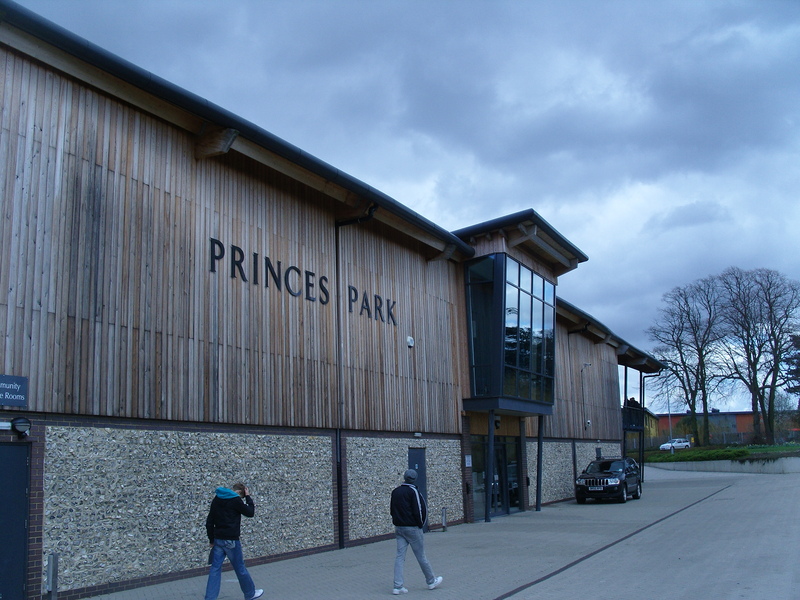 How to get to Princes Park The stadium is located close to Dartford town centre and the M25 motorway junction 2. At the roundabout with the A2 take the Dartford town centre exit. At the next roundabout take first left and straight over next roundabout. The ground is on your left hand side as you go down the hill. Princes Park is also served by a dedicated “Fastrack” bus stop which runs from the railway station to Bluewater shopping centre. The use of public transport for travel to the stadium is encouraged, although there is a dedicated car park with spaces for up to 300 vehicles. Vehicle access is via Grassbanks, a new road named by the winner of a local newspaper competition. On non-matchdays, this is available for use as a “park and ride” station for users of the Fastrack bus service. Alternatively the stadium is a 15 minute walk from the station via Central Park or Darenth Road which is the first road on your right as you climb the hill out of the town centre (next to the Malt Shovel pub). Getting a ticket for Princes Park £12 for Adults, £6 for concessions and £2 for children is all that it costs to enter the ground. The stadium holds over 4,000 and it is only the pre-season games against the likes of Millwall that have sold out, although expect potential bumper grounds against the likes of Ebbsfleet United if they end up meeting next season in Blue Square South. 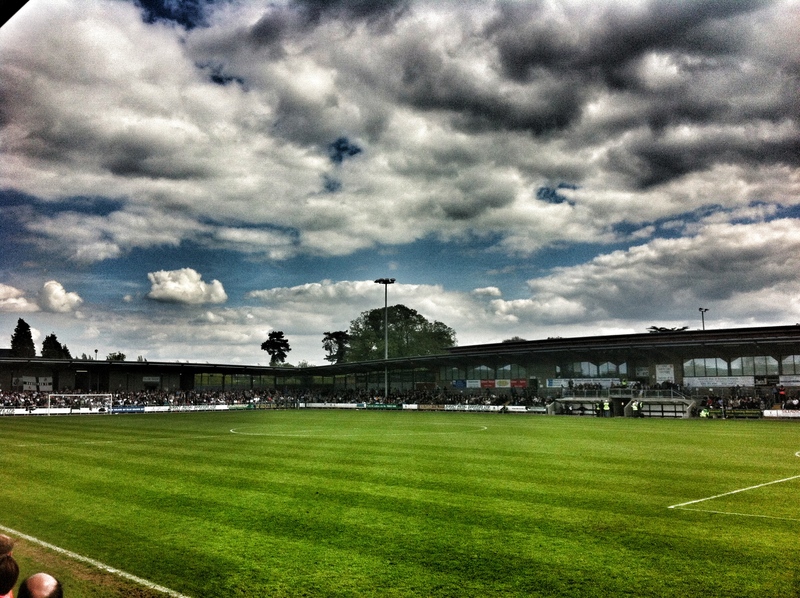 OUR LAST VISIT – May 2012 I’ve never really hidden my admiration for the progress Dartford have made on and off the pitch in the past few seasons. Just a year or so ago I waxed lyrical about my upbringing just down the road from Watling Street and my afternoons spent running around the terraces here.. Back in “the day” they were one of the top Non League teams in England, along with the likes of Wealdstone, Altrincham and Weymouth. In an age when there wasn’t any automatic promotion to the Football League, the top non league clubs had to apply for election to the League each season and hope that the Football League Chairman were satisfied with the contents of the “envelopes”. Consequently only seven clubs were elected into the league by this method, the last being 1978. Dartford came close to making the step from the Non Leagues to the Football League on a number of occasions, the last one was in 1974 after they won the Southern League, and reached the final of the FA Trophy. Ten years later, after the formation of the Football Alliance (basically now the Blue Square Bet Premier), they finished third, the highest place they have finished in their history. Since then it was a tale of woe that saw them penniless and homeless in a space of a few years. A nomadic existence followed at places like Erith, Thurrock and Gravesend before a local council with a vision stepped in, finding them a home back in the town. Not just any old home though. Must has been written, and awards have been won for the 4,100 capacity Princes Park, just over half a mile away from the old ground (now of course houses) in Watling Street. You can read all about what makes the stadium so different here but suffice to say its bloody marvellous. Just a few months before the ground was opened in 2006, Terry Burnham was re-appointed as manager with the club in the lower reaches of the Southern League. Since they have never looked back, rising through the leagues until they reached the Blue Square Bet South for the start of the 2010/11 season. This season has been their best yet. An epic battle with eventual champions Woking went to the last games of the season, whilst average attendances have top 1,200 – the best the club has had for three decades. But it is still not a finished job. One game is left. One game that would shape the season. One game that would take them back to where they were nearly 40 years ago in that elite group of Non League clubs. Standing in their way was Welling United from just down the A2. The Wings themselves were looking to return to the top level of Non League football where they had played for a magnificent fourteen seasons up until 1999/2000 season. They had a corker of a season as well, finishing in third place under the guidance of highly rated manager Jamie Day. To say this was the biggest game Kent had seen in years was an understatement. As soon as the two clubs won their semi-finals against Basingstoke Town and Sutton United respectively, all the talk was of this one. Tickets went on sale for just 10 hours. 4,100 of them were snapped up, making it the first sell out at the ground since the opening fixture back in November 2006. Fortunately, CMF had been employed to camp out at the ground all night to be one of the first to get our tickets. Don’t worry – I made her some soup and bought her a copy of Women’s Own to read. It didn’t rain that much anyway so all was well as she came home on Wednesday, slammed four tickets on the table and disappeared up to the bedroom. Danny, Deaks and Dave would be pleased. Win this game and you would be swapping an away trip in front of 200 to the likes of Weston-super-Mare or Thurrock for Lincoln City, Grimsby Town or Hereford United. The revenue gap between the two leagues is huge, and that is why it is sometimes a step too far for some clubs, such as Bath City and Hayes & Yeading, although both Dartford and Welling United can take comfort from the excellent progress made by Braintree Town this season in the Premier after promotion. For such a local game it we were letting the train take the strain. Just a twenty minute from TBIR Towers to Dartford would give us plenty of time for a spot of culture. Perhaps a visit up to East Hill to see the site of the former City of London Lunatic Asylum (they called apples, apples back in the day), then onto York Road where the Duke of York surrendered to King Henry VI and finally to Powder Mill Lane, where of course we all remember John Spillman set up the first paper mill in England back in 1588. Alas, we had tried to get access to the little known Dartford Cable Tunnel, which runs under the Thames to Essex and is owned by the National Grid but our request to “leapfrog the Thames” had been flatly refused. So instead we had to make do with such fine historical establishments as the Malt Shovel, The Wat Tyler and the Rose which was once owned by larger than life Darts player Andy Fordham. 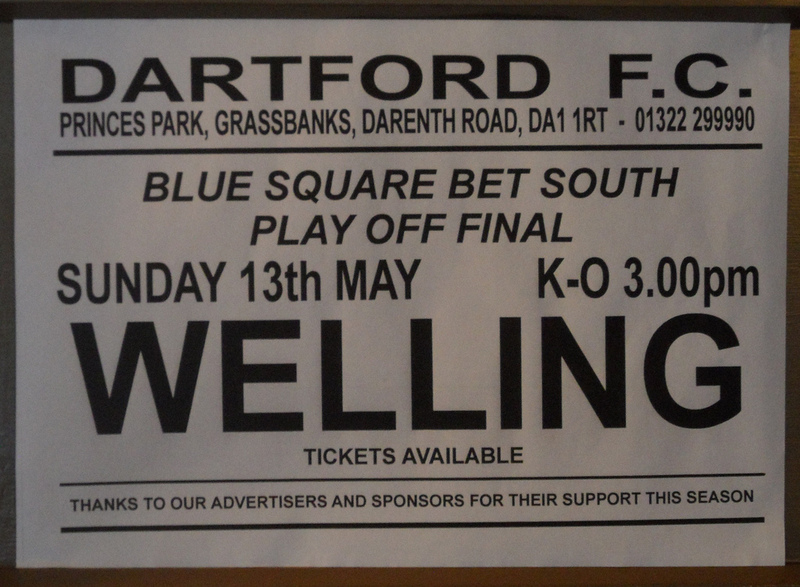 Dartford 1 Welling United 0 – Princes Park – Sunday 13th May 2012 I am always confused as to in which games it is the performance or the result are more important. This was certainly one game where it was all about the result, which was quite fortunate because as a spectacle it failed to live up to the pre-game hype and the explosive start that Dartford made. The game had been sold out for days and to be honest we expected some sort of chaos outside the ground. Being English we of course left the pub with twenty minutes to go and got to the ground with a few minutes to spare. But it seemed that the vast majority of the 4,088 crowd were already in situ. For the first time in what seems like months I was going to be watching a game in England with the sun shining. After all, the cricket season was only 6 weeks old! As soon as we found a spot on the terrace underneath the big wooden man Dartford took the lead with a goal worthy of winning any play off final. Lee Noble picked the ball up in midfield after just two and a half minutes, took the ball forward and fired the ball from 25 yards into the bottom corner of the Welling net. Bosh…First blood to the Darts. One should have been two a few minutes later when the direct approach from the home side saw the ball find Bradbrook unmarked in the six yard box but he headed wide. Welling then found their rhythm although it was a little bit in the style of Stoke City. There seemed to be far too many end passes hit long and high to no one in particular and whilst Welling won the half in terms of percentages, the score reflected the chances on goal. We headed up in the Princess Suite for some half time refreshments. The licencing laws in this country are truly bizarre. Whilst beer could be served in this huge bar, blinds were pulled down to stop anyone looking at the game. You could peer around the edge of the blinds and get a sneak view, but woe betide anyone who tried to raise the blinds even an inch. Tut tut. With one of the most exciting Premier League campaigns unfolding on the huge TV screens quite a few fans decided to stay in the bar, meaning we got their front row seats. Nice! The second half was more of the same. 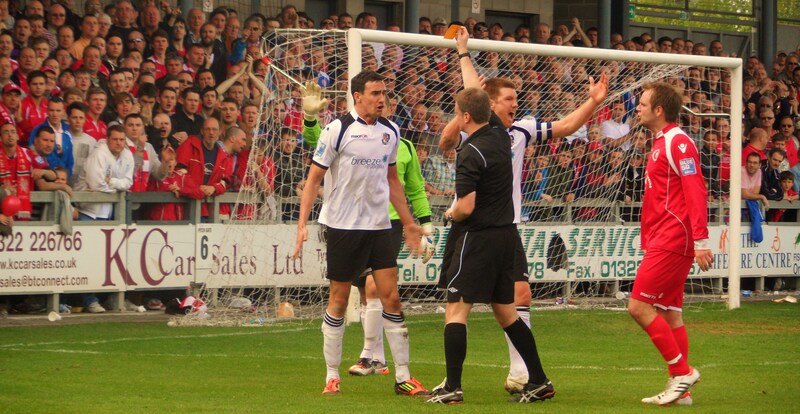 Welling tried to push forward but the solid Darts defence more often than not repelled borders. 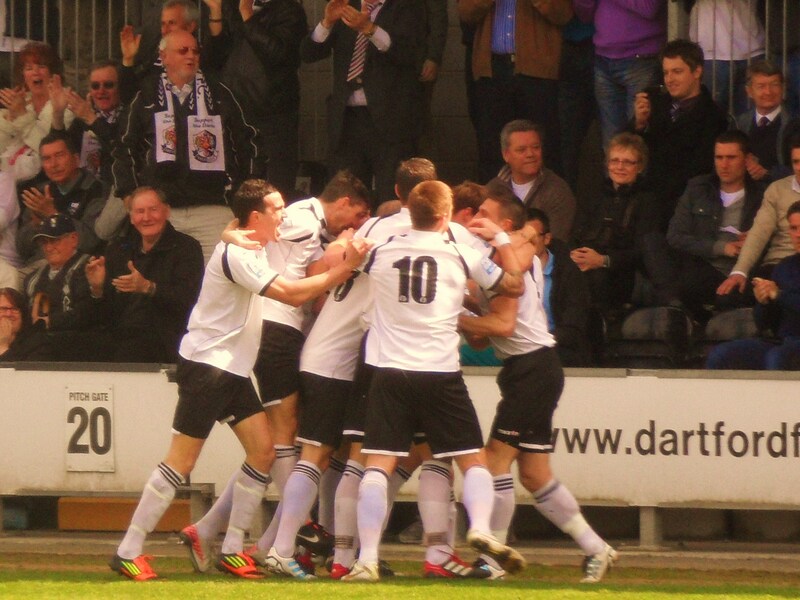 Despite player/manager Jamie Day trying to change the rhythm of the game, Dartford looked too strong. Despite our intention not to let events elsewhere affect our viewing pleasure, it was hard not to keep an interested ear and eye on the top of the Premier League. Even the Darts players had an interest as one of them asked what the latest scores were when he came over to take a throw, looking in disbelief when we told him QPR were winning at Man City. Four minutes of injury time were displayed and despite a late rally by the Wings, Dartford held firm and I do not think I have seen anyone run so quick as the referee as he headed for the tunnel, blowing the whistle as he ran down the tunnel. Good to see solidarity with his linesmen who stayed on the pitch trying to retrieve the ball. Dartford were promoted. They had finished second on merit and were now going up to the top level of non league football after a 26 year gap. Manager Tony Burman has very carefully and cleverly built a team that can compete at every level they have played and you can see that some of the work is already in place for next season. As for Welling? Another great season punching above a number of teams who have more financial resources (Chelmsford City and Havant to name but two). They would be back I am sure next season when the competitive landscape without Woking and Dartford (and with Bath and Hayes coming in opposite direction) is easier. But who knows what Non League football will throw up. 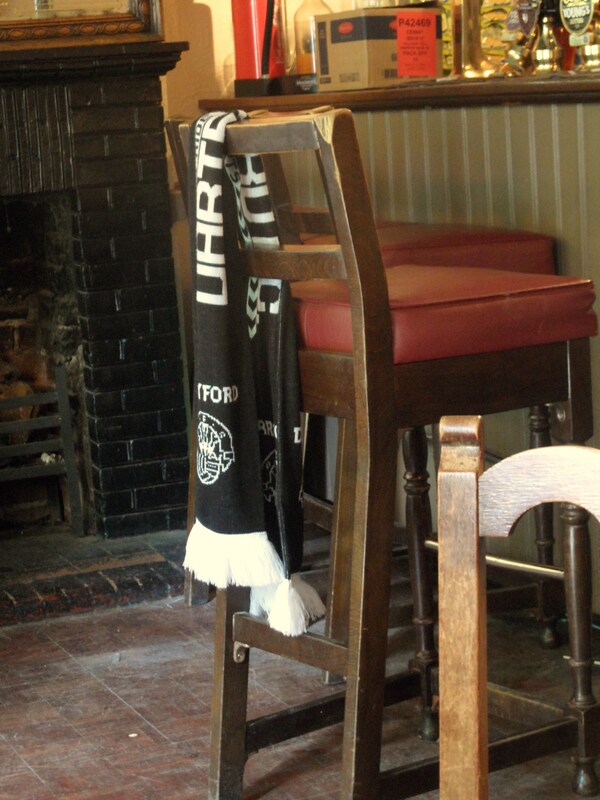 April 2010 The next few weeks could be pivotal moments in the history of Kentish football. For far too long Gillingham have held the monopoly as Kent’s only league team but that could soon change. Whilst Ebbsfleet fight with relegation after the glory years of the Myfootballclub.com ownership fade away there could be a challenge both from Dover Athletic who are poised for a play off spot to reach the Blue Square Conference after a long absence, as well as from Dartford who are just one game away from promotion to the Blue Square South. Of course it is more than possible that Dartford may find themselves next season with local derbies against Ebbsfleet (should they be relegated) and Dover (if they fail to progress in the play offs). Good times indeed. The Fuller family have a long tradition of supporting Dartford as a second/third team. As part of an article I have been researching about “My first game” my brother regaled me of a couple of classic stories from the early 1970’s when Dartford were in their golden period, including the club’s one and only visit to Wembley in 1974 for the FA Trophy final where they lost 2-1 to Morecambe. They also won the Southern League in that season which entitled them to apply for a place in the Football League, but with so many other clubs ambitions under the old “re-election” system they did not get enough votes for promotion. The following season they played a strong Wimbledon team in the Southern League which included Dickie Guy in goal (who was later to find fame in saving a penalty in a cup game versus Leeds United) and a certain Dave “Harry” Bassett who was sent off in a 2-0 defeat. So what was special about this? Well it was the club’s third game in four days over the Easter period! The following season the club reached the first round of the FA Cup and lost narrowly at Watling Street to Plymouth Argyle. However one story that he remembers from the season was a game versus Grantham Town when fed up with the stick he was getting from a particular home fan, the away goalkeeper hurdled the fence around the pitch and chased the fan into the car park, whilst the game carried on for a couple of minutes in his absence. The decline of the club in the 1990’s has been documented in detail elsewhere and the part played by Maidstone United’s move into Dartford’s Watling Street ground. But after a significant period in the wilderness, sharing grounds with Erith & Belvedere (technically sharing with Welling United), Purfleet (now Thurrock) and Ebbsfleet (or Gravesend & Northfleet as it should be known) they returned to a new purpose built state of the art stadium in the town in 2006. The ground has won a number of awards for its futuristic design and use of “green” methodologies – in fact fashion designer Wayne Hemmingway once described the stadium as “the best in the country”. So after a steady rise up the lower non-leagues the club finished 8th last season in the Ryman’s League Premier. However, this season things could not have been better for the most part. They climbed to the top of the table after the second game of the season and have stayed their ever since. Apart from a little wobble post Christmas their form has been imperious and promotion as champions was odds on. They are without doubt the biggest team in the division, and will also make a serious challenge next year in the Blue Square South both on and off the pitch. We had been down to Princes Park before, in March 2007 just a few months after the stadium opened when they beat Croydon Athletic 3-0 in front of a few hundred. But after the annual TBIR garden spring clean (which included breaking a £500 lawn mower) I was given permission to head off to their game with Canvey Island for being such a good boy. At exactly 10 miles from TBIR and just 17 minutes down the road it was one of the easier grounds to get to, and after leaving home at 2.15pm I was in the bar enjoying a cold pint less than half an hour later. Dartford 2 Canvey Island 1 – Princes Park – Monday 5th April 2010 With the sun shining at last the locals had come out in force and took their place behind the Canvey goal but it was the away fans who made the most noise early on, spurred on by some indecision in the Dartford defence. It is often the case that teams who for so long have dominated the league start to doubt their own ability with the finishing line in sight and this was the case for long periods in this game. And consequently it did not come as a surprise when Canvey took the lead from such indecision when Greg Cohen smashed the ball home after the Dartford Keeper, Andrew Young had failed to clear the danger. The away fans (of which there was no more than 20) when wild…”We’re going to win the league”, “You only came to watch the Canvey” and my favourite “Sh1t ground, no fans”. As the half progressed the referee Mr Harris seemed to want to get involved more and more in the game – but not in a proactive way. He showed little consistency, seeming to give every decision to the away team in a tetchy first half. Canvey played a flat back line with an offside trap which whilst effective was crap to watch. My view is that the offside law should be scrapped at this level to make games more entertaining. Half time came and Dartford trudged off with a need of an injection of confidence. Manager (and Director) Tony Burman made some changes bringing on Rob Haworth who was soon booked for “persistent fouling” which was impressive considering it was his first challenge! Dartford continued to struggle until the 68th minute when Danny Dafter (name of the day, closely followed by Canvey’s Gabriel Fanibuyan) was allowed to run unchallenged through the Canvey defence before his pass found Danny Harris and is miss hit shot fooled the keeper and the ball rolled into the net. Game on! With news filtering through that Kingstonians and Sutton United losing, Dartford sensed blood and went for the kill, finally starting to put the Canvey defence under pressure, and with 12 minutes to go Ryan Hayes crossed to the back post and Elliot Bradbrook stormed in to head home. The home fans, of which the 1,319 was bigger than every game bar one in the Blue Square South and North, and bigger than three games in the Blue Square Premier including local rivals Ebbsfleet United. They left licking their lips at the prospect of promotion with a win away to second placed Kingstonians in a few days time. Welcome back Dartford! For more photos from the game click here.